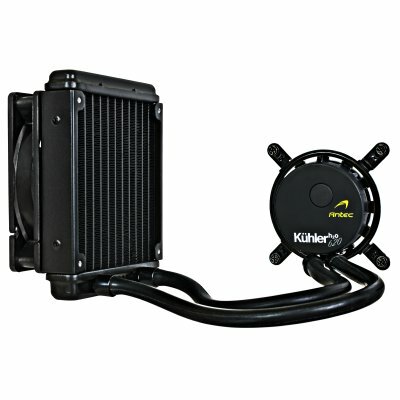 Antec KÜHLER H₂O 620 all included liquid cpu cooler. Keeping the most important part of your computer system cool has been something gamers and enthusiasts have struggled with for years. The battle between discreet liquid cooling systems and air cooled alternatives has raged with the primary debates being efficiency and safety, this is a delicate balance that needs to be maintained because liquids and electrical components do not mix very well. Air coolers are not overly known for their efficiency and are generally regarded less effective when compared to a liquid cooling system. Antec has paired up with Asetek to produce the Kuhler H2O 620 which relatively low priced cooler aimed at primarily enthusiasts who are looking to either overclock their system or just lower the noise output. One of the first all in one coolers with flexible tubing. The Antec KÜHLER H₂O 620 delivers high-performance liquid cooling for your CPU in a quick, easy-to-install package. Unlike traditional liquid cooling systems, this self-contained unit comes prefilled and requires no maintenance. The voltage-controlled 120 mm fan and 3rd generation copper cold plate ensure efficient cooling, while the estimated 50,000 hour pump lifetime means this cooler is even likely to outlast the system it cools. Lastly, easy-bend flexible tubing allows the KÜHLER H₂O 620 to be installed in nearly any orientation. Take your PC’s Quiet Computing™ to the next level with liquid cooling performance at a price that rivals aftermarket air coolers. I will be testing the Antec Kuhler 620 by installing it as per the included instructions. I will monitor temperatures using core temp version .99.8 which has proven to be reliable in temperature readings on this processor which will be the AMD Phenom x4 970 black edition which runs fairly hot on its stock 3.5GHz. I will also test how it stacks up against the ECO ALC cooler from CoolIT, a product we have reviewed in the past and which shares a lot of similarities with the Kuhler 620. CoolIT’s ECO cooler is very similar to the Antec Kuhler in that they are both self contained liquid cooling systems.